TOPIC | FR Secret Santa - Rematch! 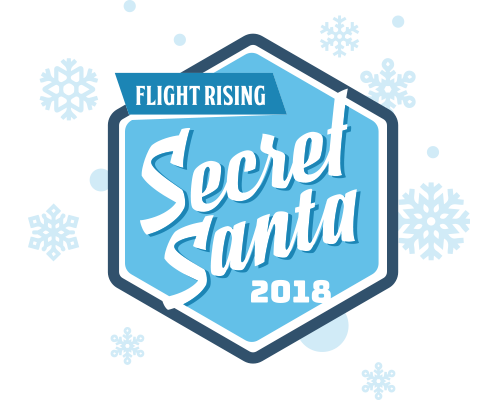 Hello and welcome to the 2018 Flight Rising Secret Santa Exchange! At this time, users have been matched and assigned an elf. You cannot back out of the exchange at this time. Thank you for understanding! The time for shopping and preparing your gift is up! Delivery begins now and runs through December 25. Thank you! There are 765 Santas participating this season! A Secret Santa exchange is an optionally anonymous exchange of gifts within a group of people. Participants are matched at random and gifts are distributed through a third party, so that all gifts are delivered secretly. Santas can choose to remain anonymous or have their identity revealed at delivery. Everyone is welcome to join the exchange, no matter their flight or account age. Come spread some holiday cheer! xxxxxOct. 17 - Nov. 30, 18 FR time: Sign ups. OVER! xxxxxNov. 30 - Dec. 3: Matching. OVER! xxxxxDec. 3 - Dec. 21: Shopping. OVER! xxxxxDec. 21, 23:59 FR time: Deadline to send your match's gift to your elf. xxxxxDec. 22 - Dec. 25: Delivery! OVER! xxxxxDec. 26 - Jan. 12: Rematch event. OVER! The exchange has 4 financial tiers for participation: 20k and up, 50k and up, 100k and up, and 500k and up. Participants will be matched with another user in their financial tier. You must follow the event guidelines for gifts (see below) and provide a gift worth no less than the minimum of their tier. Your Santa will do the same for you. However, THERE IS NO MAXIMUM! Especially generous Santas are welcome to shower their match with gifts beyond measure. Gifts are to be delivered to your elf by the deadline December 21 at 23:59 FR time so that they may be delivered in the following days. Do I have to reveal myself to my match? Can I change the information on my form after I've sent it? Can I update my wishlist throughout the exchange? What happens when someone doesn't receive a gift? What if I don't like my gift? How it works: Your elf will provide you with your match’s wish list. You shop for the perfect gift and send it to your elf. Then, your elf delivers that gift to your match come Christmas! The process is that simple. It's the gift that's the challenge! While you are not required to shop exclusively from your match's list, please send something that you would be happy to receive. If you have questions or concerns about your match’s wishlist, talk to your elf! See below for some help and guidelines. Participants may gift any item to their match, including but not limited to: gene or breed change scrolls, eggs, vistas, skins/accents, materials, apparel, familiars, pure treasure or gems. Dragons may also be gifted but CANNOT be sent as the only gift and do not count for the 50% minimum value of your gift. If your match does not want dragons, you cannot send dragons. Your match’s wishlist will specify. You are welcome to give art and services, but they are considered stocking stuffers and do not count towards the value of your gift. Unfortunately our elves have no way of fairly evaluating non-site items. Please keep this in mind when choosing your participation tier -- you are expected to provide site items up to the minimum required value. Your gift must be worth the minimum value required by your tier on Dec. 21. One item in your gift must be worth at least half of that value. However, there are exceptions. You may also gift gem MP items or treasure specialty tab MP items that add up to half the value of your tier. Please discuss with your elf any issues you run into, but the short of it is: the closer you follow your match’s wishlist, the less your adherence to the second rule matters. For example -- you are in the 500k tier and your match’s wishlist reads: “I am collecting eggs for my birthday hatch.” Eggs are not 250k items, especially around NotN when all egg prices plummet, but if you send enough eggs to meet the 500k minimum, you will have followed your match’s wishlist closely and met the requirements. Scrolls, vistas, and gem MP items are valued at their MP price. All other items are valued at their lowest AH price. Only site items are used to calculate gift value. NotN items' values plummet during the event. Do not use their pre-NotN value when preparing your gift. ALL unhatched egg values plummet during the event. Two or more gene or breed change scrolls can be used to meet the half tier value for the 500k and up tier. Gem MP items can also be combined together or with scrolls to meet the half tier value requirement. Ready to join? Click below! The exchange would be nothing without our team of elves! If you’ve ever wanted to be involved with the FR community and make some new buds, please consider joining the team! Elves are the primary contact for participants to the exchange. To keep things secretive and flowing smoothly, elves work behind the scenes to deliver and answer questions, accept and record gifts, and eventually deliver them. They also prepare roleplay-style welcome and delivery messages from their dragon or clan to their group of Santas. We do everything in style! Elves are welcome to participate in the exchange while also volunteering. Please keep the following in mind: this is a huge time commitment! Elves must be active and readily available during all of December. You will have people relying on you to answer questions and take care of their gifts. You will occupy a position of trust and it comes with more than a little pressure. Understandably, elves should have good communication and listening skills and be comfortable communicating with plenty of people. You should also be familiar with Google Sheets and be good at record keeping. However, it’s not all doom and gloom! There are typically dozens of elves and some of us have been doing this since the very beginning (and it hasn’t scared us off yet!). Any questions you have, we can answer. We have each others’ backs. Elves are given four days to perform our two big tasks -- welcome letters and delivery. You don’t have to squeeze duties into a 12 hour chunk of time. We also begin delivery on December 22, so you don’t have to excuse yourself from Christmas dinner to do some Weird Internet Dragon stuff in front of your family. SSE utilizes Discord for elf-to-elf communications, discussion, and questions, so potential elves must be willing to make a Discord account if they don’t already have one. It's free and anonymous -- no email required. Finally, I must insist that all elves be at least 16! Sound good? Please PM me the following application. Share a bit about yourself. What makes you want to be an elf? Have you volunteered for an FR event before? I don’t believe any past elves would say that it isn’t a lot of work, but I think we would all agree that it is a rewarding experience! Need more gifting in your life? Check out these other exchanges! Is there an exchange in your flight forums that isn't advertised here? Please let me know and I'll share the link! For some other seasonal fun/raffles/contests, please see below! Ping for those that requested one last year. Aaaaaand welcome to 2018, friends!